Remember the sixties? Click here to play! We certainly do, and it was a wonderful time for freedom, happiness, and excitement. Relive your glory days at this classic slot for your chance to win exceptional cash prizes. 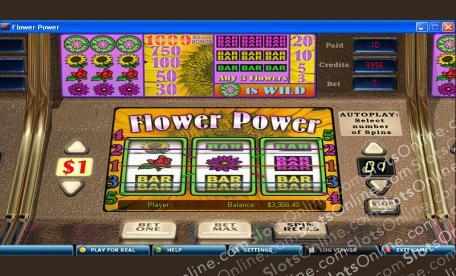 Flower Power is a retro slot played over 3 reels and 5 pay lines, where the more lines activated means more opportunities for winning combinations. There are no Scatters or Bonuses, but the Flower Power logo is Wild and can be substituted for any other symbol on the reels in order to finish off lucrative combos. Every type of flower will help you win bigger and better payouts, but the most lucrative is the Flower Power. Land the ultimate combo and you’ll find yourself with 1,000 times your initial wager! Start playing Flower Power today for your chance at incredible winnings! The Flower Power logo is Wild and can not only pay out up to 1000 coins, but can also be substituted for any other symbol on the reels.